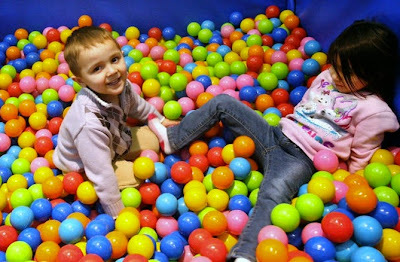 MASON CITY | Sensory World in Southbridge Mall is a place where special kids with special needs get special love at a special place to learn and play.Located across from Subway in the area that formerly housed an arcade, Sensory World is the newest addition to the mall. It is open from 1 to 4 p.m. each Saturday for special needs children up to the age of 12, accompanied by an adult. It is free. Beginning in February, it will also be open on Sundays. "It provides a safe place for special needs children to come and play and practice social skills," said Victoria Ries, who is co-president.She was a school teacher for 25 years and has an adopted son with autism. She saw the need for Sensory World and started to put the pieces together. She works with a five-member board of directors. Board member Jessica Dodge, who has a niece who is autistic, said support group meetings for parents are held once a month and there is also a lending library available for adults. Special events are also being planned for the children.There will be a black-tie fund-raising gala — Reach for the Stars-Special Kids, Special Loves — from 6 to 9:30 p.m. Friday, Jan. 30, in the ballroom of the Historic Park Inn Hotel. Tickets are $100 and can be purchased at the hotel or online at www.specialkidsspeciallove.org. The next day, Saturday, Jan. 31, at 1 p.m. there will be an open house at Sensory World in which the public can see what it is all about.